What is a 'Big Buck'? Big Bucks work just like cash at participating Neligh Chamber of Commerce businesses. There are two different denominations and your Big Bucks are backed by legal tender in a bank account at a 1 to 1 match. The program was started to put a different spin on the Chamber’s shop local campaign. This fun and inventive program to encourage local shopping. Where can I buy Big Bucks as a gift? They are available at the Chamber of Commerce/Economic Development Office. ​ Just bring in cash and you can leave with a handful of Big Bucks. I'm a business, where can I redeem the Big Bucks I've accepted? 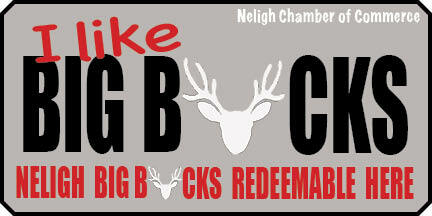 Big Bucks can be redeemed by businesses only at Pinnacle Bank in Neligh. If you want to accept Big Bucks, click here.